Home / # change whatsapp number / # Computers and Technology / # data loss / # data save / # how to change whatsapp number / # personal data / # Science and Technology / # Tech guide / # whasapp / News / technology / Whatsapp smart trick-Your data will stay safe even if you change your number. 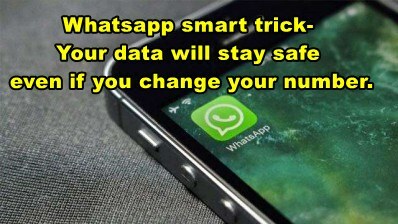 Whatsapp smart trick-Your data will stay safe even if you change your number. Many times we have to change our Whatsapp number or change the smartphone. Sometimes our personal data gets deleted because of changing the number of Whatsapp or changing the smartphone. A feature has been added in Whatsapp in 2017 which prevents you from deleting your personal data. With this feature of Whatsapp you can save your Whatsapp data. But for that you have to use the same smartphone. Today we are going to tell you the easiest steps to change the Whatsapp number, with the help of which you can change the number of non-personal data deleted. After this you will see three dots on top. You tap on these dots. After you tap on the dots, you see many options, tap on the settings of these. After tapping on the settings, you will see an account option. After tapping on the accounts, you have to tap 'Change number'. In the first tab you will have to enter the old Whatsapp number, which you are using. In the second tab you will have to enter a new Whatsapp number, which you want to use. After the tap on Done, the verification process will be completed. Once your verification is complete, your number will change and your data will also be saved. Your data can stay safe even when you change the smartphone or re-install the app because Whatsapp's data is automatically saved in your Google Drive. If you use a new phone, after installing Whatsapp, as soon as you configure your account, you will see the option to Restore Data. In this you can restore your old data. Keep in mind that this will restore the data upto 24 hours before you. Data from a few hours ago will not be restore because its backup is not made.